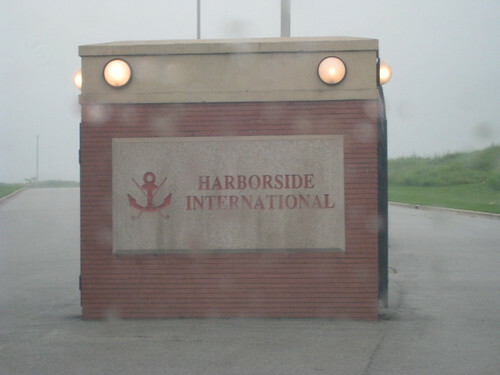 I’d heard a lot about Harborside International Golf, just south of the city of Chicago, and was lucky enough to play it one rainy, Sunday morning. Luckily, the rain stopped just as we were approaching the first tee, which made the course play longer, but was much better than playing in the rain. We played the Port (or Portside) Course. There’s also a Starboard course, and by what I’ve read, the Starboard is the preferred of the two. That being said, I thought the Port was a great track, with some interesting holes and great view of the city. Now I can’t wait to play the Starboard! The opening hole is a pretty straight-forward par 4 (I’m a fan of opening “practice” holes) but it doesn’t last long. 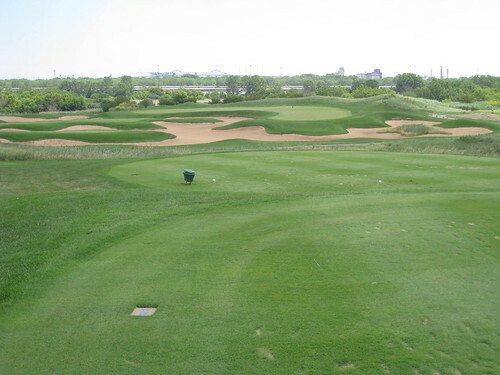 Number two is a reasonably long par 5, with an elevated green, surrounded by bunkers. There’s also a strategically placed bunker in the right side of the fairway, which actually can wreak havoc on your second. I thought this was a welcome change; rarely is there “trouble” with your lay-up on a par 5, but there is one here, so watch out for it. 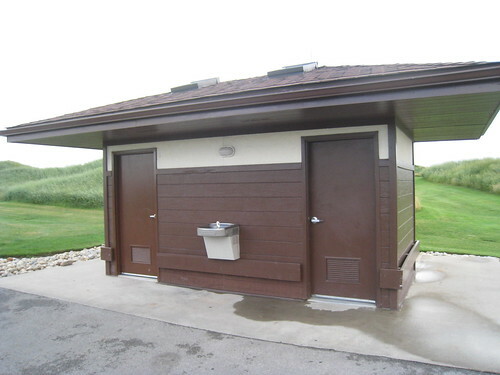 Most of you know that I pay attention to restrooms on the course and specifically, how often they are available (this happens to married men whose wives play golf). At this course, it’s really a non-issue. I passed the restroom so many times, I forgot to count, and that’s no lie. 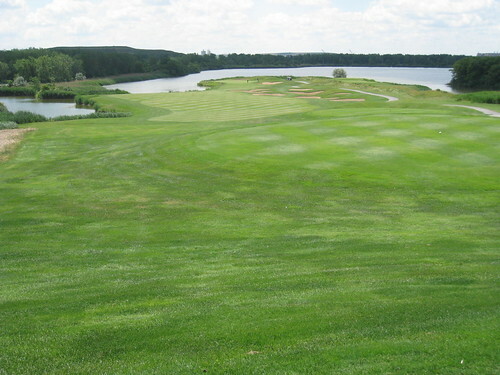 They are clean, readily accessible, and the course is built so that you’ll pass them often. A+. The third is a reasonably short par 4, at 374 yards. Do everything you can to stay out of the bunkers; you’ll thank me later. If you do avoid them, this is a potential birdie hole. The fourth is plenty of a par 3, at 207 yards. The green is thin and long, and there are lots of “deeper-than-they-look” bunkers in the front. 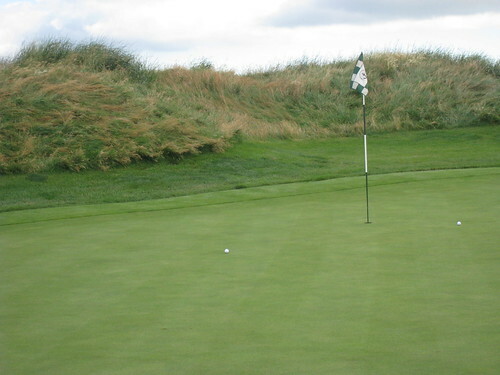 A little room behind the green, but it will leave a tough lie, so try to stick something on the putting surface. 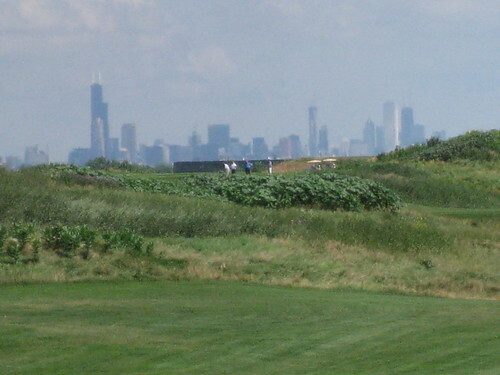 Playing 5, you can see some of the taller buildings in the city. On a clear day I’ll bet you can see a lot more. 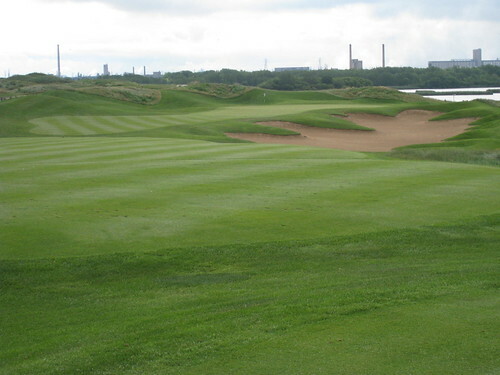 Harborside is considered a Links-style course, and that means few trees, and lots of trouble. 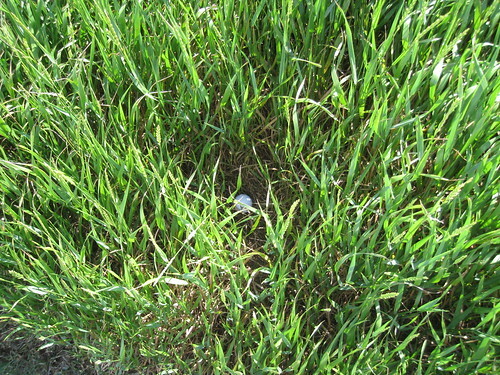 I took a closer shot of the birds nest-rough around the green, to prepare you. If you end up in this stuff, forget it. 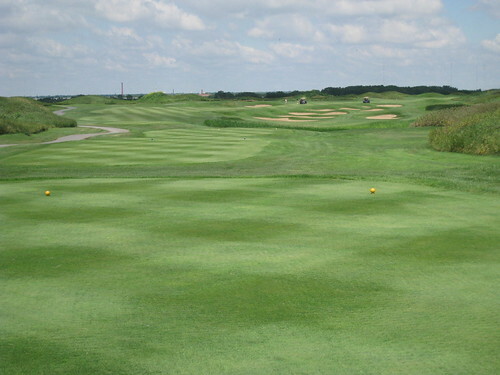 The ninth is a par 5 with lots of trouble. How can there be trouble on a Links course, you might ask. Well, here are two perfect examples. 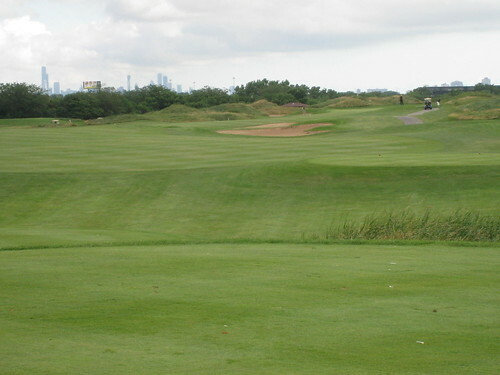 One, note the tall grass on the left side of the fairway. This type of grass hugs the left side all the way up the fairway. And here’s what a ball looks like when it’s buried in this grass. Two words; Forget it. 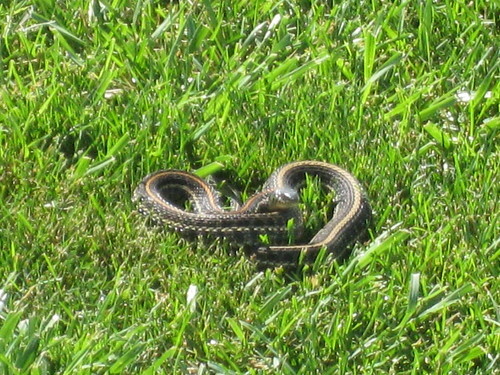 Secondly, we found a little “friend” soaking up the sun on the ninth, very close to this tall grass. Doesn’t look like much and he basically ignored us, but be wary. This is the definition of trouble. Playing ten gives you one of the best views of the city. I zoomed all the way in, so it’s not the best picture of the group, but it’s still worth including. 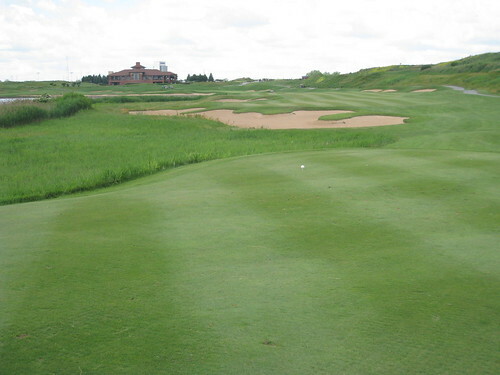 The twelfth is a strong par 4, with trouble left, bunkers right, and a smallish green. The tee shot is key here, so be careful. 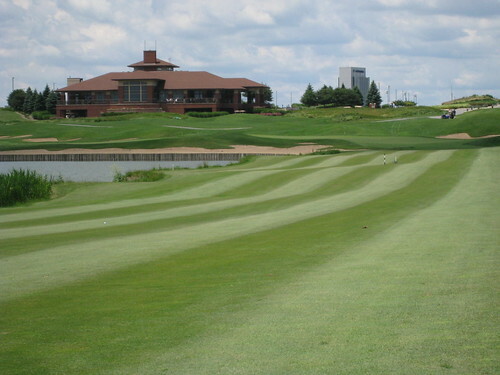 Starting with the fifteenth, the final four holes are really something to behold. 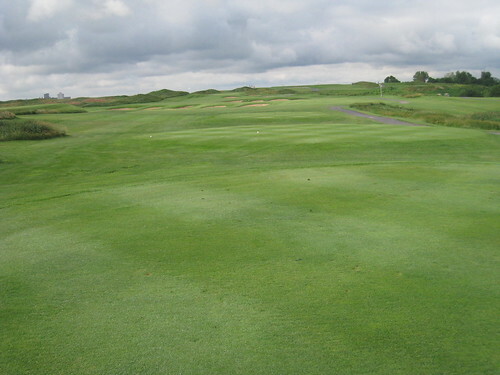 This is a downhill par 3, with wind at your back, and depending on pin position, could be a very difficult hole. The green is shaped like half of a bagel, which can also make for dramatic changes to the distance, and the club selection. Good luck here; most of my group ended in the sand. The 16th is a downhill par 4 with a green surrounded by water, sand and junk. 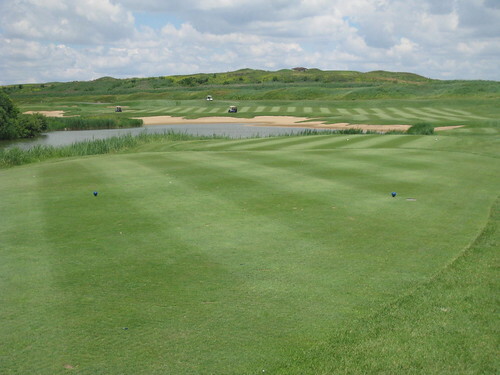 Be careful on your tee shot, as there’s trouble on both sides of the fairway too. 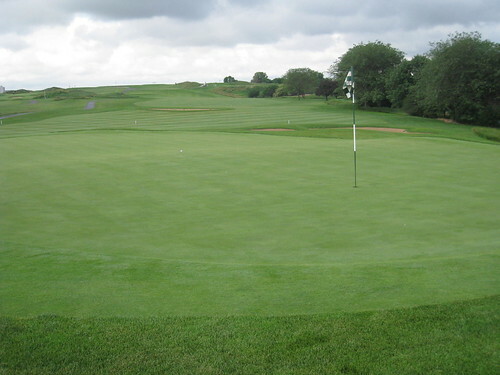 The one negative I found at the Port course was on this green. There were an abundance of geese here, because it’s so secluded from the rest of the course, and kind of on the tip of a peninsula. Of course where there are geese, there are droppings, meaning the green was covered. It was so covered, that a long putt was out of the question. A border collie would potentially fix this problem. The seventeenth is a wonderful hole, and even though only a par four, offers you a risk/reward option. You can hit a shot to the fat part of the fairway to the right, but you’ll be left with a long second into a strong wind. Your other option is to cream a driver, and cut over some of the water and sand to the left, leaving you a shorter iron to the green. Either way it’s a tough hole, and it’s going to be in the wind, so base your decision on your confidence in your driver. 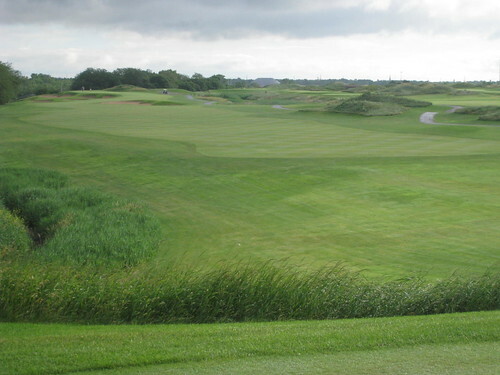 The eighteenth is a 502 yard par 5, which seems short, until you factor in the wind. I hit my best tee shot of the day, and a mediocre hybrid, and was still left with a full 7-iron. There’s water to the left all the way up, and strategically placed bunkers around the green. This is one of the most demanding finishing holes I’ve ever played. You’ll really need to gather yourself mentally to par this one; it’s brutal. 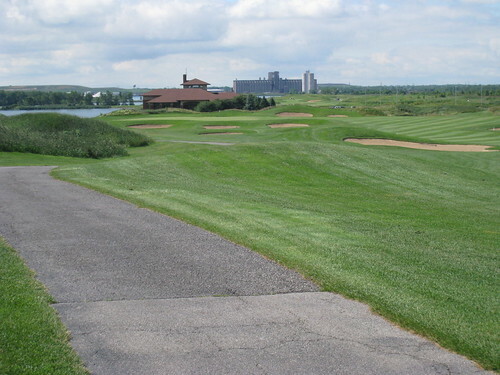 Even though I shot a very large number at the Harborside International Port Golf course (yes, it broke the three-digit mark, but just barely; ouch), it wasn’t so brutal that I wouldn’t come back again. In fact, I’m excited about playing the Starboard, as it’s been rated a little better than the Port. For me, either one is a challenge, and a welcome addition to my roster of local courses.